A Cape glossy starling seen in bright sunlight reflects a particularly striking colour – an iridescent dark blue that shimmers vividly as the bird moves and the sun dances off its feathers. If it should move into the shade, though, the iridescence is lost and the bird becomes rather dull by comparison. It is the bright sunlight that brings the “glossy” to its name. The bird’s conspicuous orange-yellow eyes are a sharp contrast to the dark blue whatever the light, and its black bill, legs and feet complete the picture. The sexes are alike in plumage, with the males being slightly larger than the females. 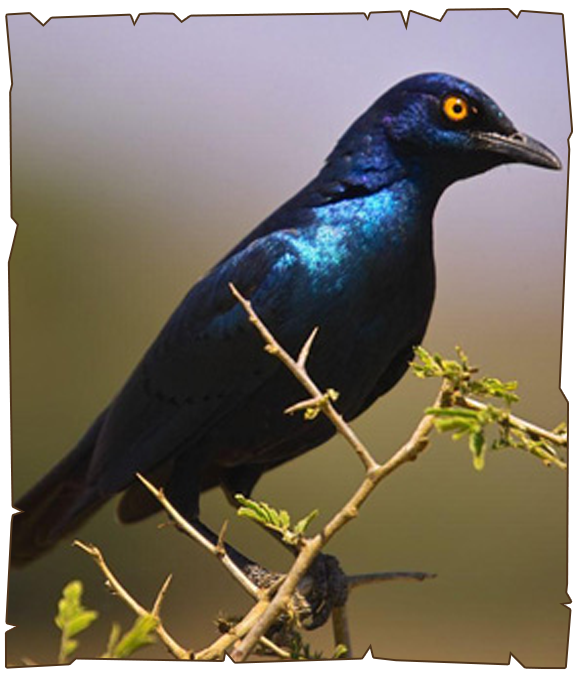 The Cape glossy starling is about 23 cm in length and is quite gregarious by nature, often being found in pairs or small flocks. It prefers wooded savannas and in the drier regions is often to be found in the riverine bush, where there is easy access to the more common items in its diet – fruit, nectar and a variety of insects. Cape glossy starlings are monogamous and usually nest in natural cavities in trees, or the holes made by woodpeckers or barbets. The female Cape glossy starling lays a clutch of two to four pale blue eggs.